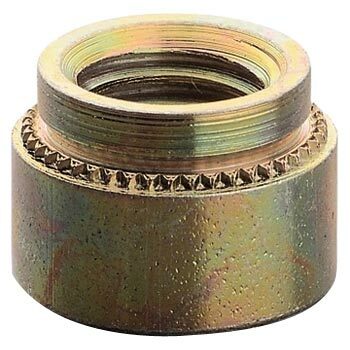 Our company manufactures Self-Clinching Nuts in steel or stainless steel with a specially formed shank. Their extensive use in thin walled molded components made from steel, light alloy, NF metal makes them pressed into the molded components along with pre-punched receiving holes. Self-Clinching Nuts are used for high torque and heavy push out applications in thin walled molded components from 0.8 mm thickness. We have gained recognition in the world market as one of the well known Self-Clinching Nuts Exporter from Kolhapur, Maharashtra, India. Minimal outside dimensions for space and weight saving designs with an aesthetic look. Medical & Pharmaceutical equipments etc.